Hidden slab on the undercut end of the second slab north of the beach. This wall lies on the north side of the next inlet. 500m west of the beach. Thin crack through the bulge on the southern side of the Graig Lwyd headland. G Smith, R Potter, May 2012. Another exciting line arcing up the left-hand side of the cave, opposite Fishura. A super sustained route, lip-traversing the arch before tackling the really overhanging quartzy groove. James McHaffie and Dan McManus AL 29/7/16. Takes the 10m roof of the cave. Takes the main feature left of the cave. This is an exceptional route of its type, requiring a great deal of body contortion and effort. Ascend the chimney and back-and-foot to the lip where a few hard moves lead to a hanging ledge. Pull your ropes through and then continue up the shallower slot passing two pegs. From the top of the slot place some cams in a flared feature before finishing in the same line on better holds. Take the slab to the left of the cave to the overhanging wall, traverse right and make your way through the groove. Climbs the left wall of the zawn. R Potter, G Smith, 18/5/12. This is the small zawn 20m west of the above area. All routes R Potter and K Potter, July 2012. From the beach car park, head left (looking out) /south to the headland. The 50 degree overhanging wall on the left side of the headland. G Mitchell, R Chainey 18/7/03. P Williams, D Dent, J Hall, D Hall, 21 Nov 1981. Paul Williams & Stevie Haston, 9 Jun 1982. A Hayes, D Hersey 19 Jun 1982. The wedge shaped wall above the sloping terrace immediately right of the 50 degree wall. Stevie Haston & Paul Williams, 9 Jun 1982. The overhang on the RH end of the crag. The groove near the seaward end of the zawn. A Newton and K Griffiths, 1987. Starts at the base of the Fisherman’s Friend groove and ascends its right arête to gain the rightward ramp, passing below the roofs. The route has a steep finale on good holds, breaking for the top of the crag midway between Fisherman’s Friend and Brewing and Nothingness . Father and daughter team, George and Catrin Smith, March 2015. A low right to left girdle of the wall. L Griffin, L Costello 24/1/10. The next route takes the large south-facing wall in the back of the zawn, capped by huge roofs. Large tidal slabs can be used to gain the bottom of the zawn. Climb the juggy wall at the inland end of the face to a prominent quartz riddled notch. Easy to begin – to moving ledges. The steepening quartzy area is protected by numerous slings. Gain a handrail to enter the left-hand niche and the top with trepidation. Plasticine forearms etc. George Smith, Alistair Hopkins, Feb 1993. 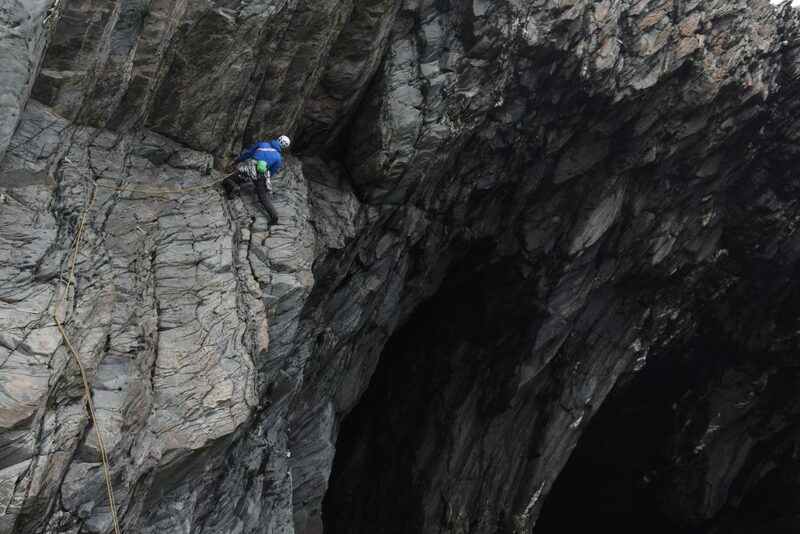 Takes the 45 degree overhanging crack on the detached promontory 100m south of Fishermans Friend. From the base of the chimney gain the sloping ledge and overhanging crack, which leads to a rest on the left before a final push to the top.With such a classic in the bag it seemed rude not to nip up the easier, adjacent line. A cracking little climb on perfect rippling rock. It ascends the big leftwards leaning ramp on the fin. From the centre of the fin ascend the ramp to an impasse. Pull over the bulge to a higher parallel ramp which leads left to the arête and a fabulous finish. A two pitch affair in a zawn to the east of the Fisherman’s Friend zawn. 1. 5a. Start from ledges on the left of the zawn just above the sea at low tide. Climb a black overhanging corner on good holds tending right to gain a ledge at 10m. Continue up and right via a short wall to another ledge and stance. 2. 4b. Follow a superb exposed line out right across the yellow headwall of the cave. Rightward slanting line from the left. A Wainwright, G Smith, April 2012. G Smith, M Crook, A Wainwright, April 2012. Buttress right of the cleft. M Crook, T Loxton, April 2012. 50m to the east is a large zawn indented by 3 inlets. The overhanging wall at the back of the central inlet. G Smith, M Crook, 2000s. Oli Grounsell below Stone Masonry. Photo: James Mchaffie from v12 outdoor. A high level left to right traverse from the top of the rock fin. G Sutton and M Hellewell, 24/4/14. Climbs the obvious left leaning flake thing. George Smith and Tony Loxton, 2000. Dame E2 5b The line just left of Stone Masonry.James McHaffie and Dan. July 2016. The central weakness in the very steep face. Climb onto a very sharp flake and layback up on good fins until it steepens a lot. Knee bar up to the horizontal crack and keep a knee in until better handholds and a good wire appears. A big backhand move right to two quartz jugs leads to a brilliant heel, move upwards to gain good holds and pinches but still a few metres of pumpy climbing to where the wall slabs off, and a step left can be made to easy ground and the top. JamesMcHaffie and Oli Grounsell, May 2016. 6 routes in the Severe/VS range climbed by Lindsay Griffin and Lou Costello in 2009.